There are so many boardgames available that it's almost mindboggling. In the 8 years I've been in the hobby, I've seen it grow from a time where you could keep up with almost every new game to a where it is now; way too many games to choose from. In a hobby as saturated as boardgaming, how do you separate yourself from the pack? What can you do to get an edge on all the other games out there? You do something original. Praetor from Passport Game Studio does exactly that. If you're here, odds are you already know all about worker-placement games. Take your piece, put it on a spot, do the action. There's a ton of games that do this already: Agricola, Stone Age, Lords of Waterdeep, Sons of Anarchy.... The list goes on and on. So how does Praetor stand out? In Praetor, your workers get better at their jobs each time they are used, until they retire. Oh, and you have to pay for them. Even the retired ones. The layer of extra thought this adds to the game is amazing. Building new tiles is a good thing because you are the owner of any tile you build. Just like in Lords of Waterdeep, If another player wants to use the tile, they have to pay you to do so. There’s also an interesting twist in that the tiles have mosaic patterns in each corner. When you place one into the city, you get points for each connecting tile that matches the new one. These points can add up in a hurry so it’s important. Unthematic? Maybe. We find that it’s a good way to score points so I don’t mind this being tacked on. Another option is to place a worker onto an unused city tile to do the action there. This is where Praetor gets awesome. When you place a worker on tiles with red in the center, the worker performs the action at his experience level. For example, if I place a 1-worker on a gold mine, he gets one gold. Put a 3 on there and you get three. In addition, any worker placed on a red tile or used to build a new building will get experience at the end of the turn and will improve by a pip. In the example above, the 1 becomes 2 and the 3 becomes 4. As your workers do jobs, they get better and yield more next turn, until they hit 6. When a worker is advanced to side 6, they retire and can no longer be used on your turn. The good news is that they are worth victory points. The bad news is you now are paying their pensions. This creates wonderful choices in how you allocate those workers. You will want to get your low-level workers more experience as quickly as possible, but they don’t give you much at first. Conversely, your more experienced workers are getting closer to retirement so you need to manager them carefully so you get maximum efficiency from them. You will also need to manage the flow of incoming and outgoing workers. Timing your recruitment of new workers is vitally important because it’s easy to get in a situation where you have workers retiring and nobody coming in. When you use the tile to bring a new worker in, you essentially have to wait two turns to use it as the workers go through training. I’ve experienced this a couple times and it really grinds your engine to a halt. Keeping a steady influx of workers is very important and creates a timing mechanism that really adds to the decision-making process. Other games have used aging before (In the Shadow of the Emperor), but I love how Praetor makes it a part of your workers’ efficacy. At the end of each turn, you need to pay for your workers. Each active worker up to and including your fourth costs 1 gold per turn. After that, they get more expensive with the next couple slots costing two and then three. You also have to pay 1 gold for each retired worker. This creates an awesome tightrope of having enough workers to be effective but not having too many where you are losing money. You also want to retire workers for victory points, but then you need to pay them for sitting at home drinking beer. That’s not a good use of money. If you can’t pay for workers, you slide down one spot on your Morale track for each one you can’t pay for. You gain or lose victory points at the end of the game for this track so you want to keep it as high as possible. Unhappy workers make for an unhappy city. A player board in the middle of the game. 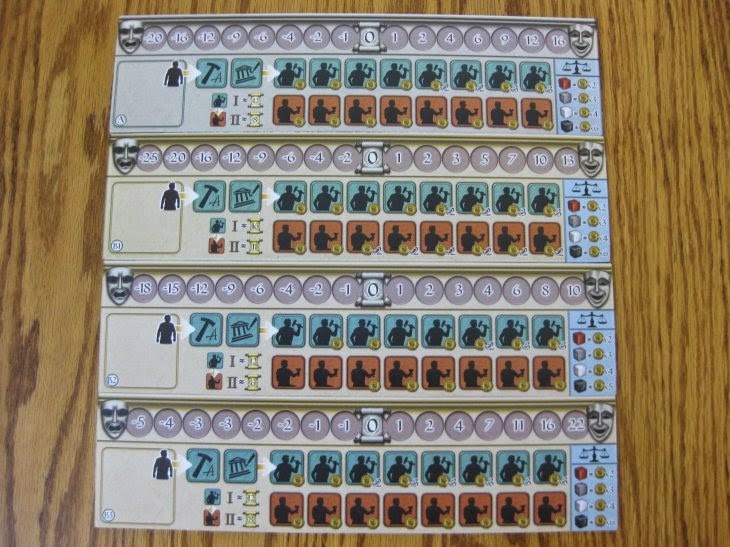 Most worker-placement games are largely non-interactive and Praetor is no exception. Like Lords of Waterdeep, there’s a bit more interaction here due to the ownership of city tiles, but it’s minimal. At best, worker-placement games are mostly passive-aggressive interaction. Lots of people don’t like this genre for that very reason, but I think it’s a good thing. Changing the landscape of the board makes you think and adapt your plans. It’s interactive without being outright nasty. 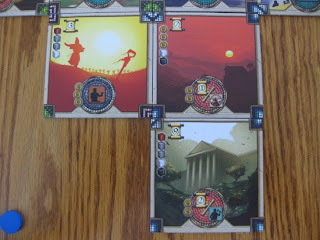 I do feel like Praetor forces you to watch the other players more than other worker-placement games. While you are mostly doing your own thing, you definitely need to be cognizant of what everyone else is doing so you can react. You really can't just stay a course in this game. You will be forced to improvise, adapt, and overcome. Praetor scales wonderfully. 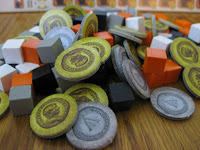 While I’m not a fan of most games at 5-players, Praetor handles it as well as any other worker-placement game. It’s an awesome 2-player experience and is perfect with 3 or 4. The game length definitely goes up with more players, but that’s to be expected. the variants. Each board is double-sided. One very nice feature of the game is the variable player boards. 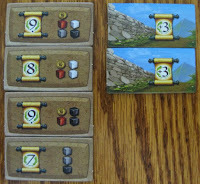 Each player board has a basic side and an advanced side. 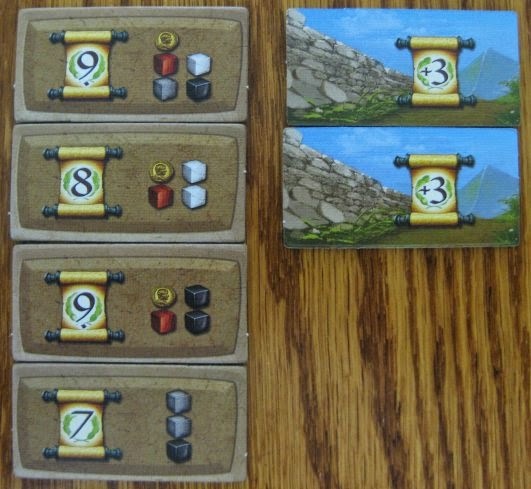 The basic sides are all the same which is great for your first game as you learn. Once you are up to speed, flip those over and get ready to see what the game really has to offer. Each of the advanced sides offers something completely different and will make each player take a different approach to the game. It adds a lot of variety to this game and definitely helps make each play feel unique. 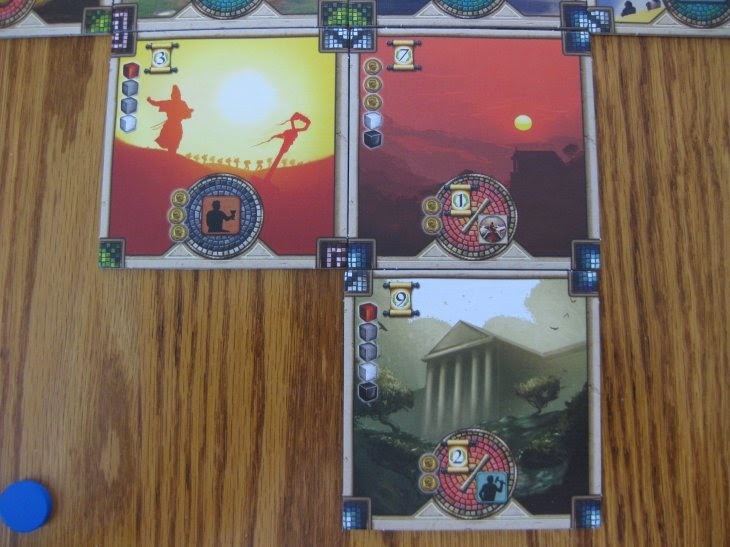 There aren’t a lot of components in this game, but I would be remiss if I didn’t mention the awesome artwork on the city tiles. It’s fantastic. It in no way affects gameplay, but it does make the game look great on the table. The dice are solid as are the wooden components. Nothing special. But boy, that art…. It should be said that there was some complaining about a couple rules when this game came out. Some people said the Labor Camp was broken and that a few of the temples were overpowered. The designer issued official errata on BGG, but I’m not sure it’s completely necessary. The Labor Camp is definitely a VERY powerful tile, but I don’t think it’s broken. We do prefer to play with the variant provided by the designer as we feel it makes the tile a bit more balanced. As for the Temples in question, I feel like those are more dependent on the players anyway so I’m not sure it needed a fix. Some people also felt like the game was too long so there’s a variant to shorten it up. Again, this is dependent on players. All worker-placement games suffer from AP. This is no exception. I love worker placement games. The simplicity of your turn options puts the meat of the gameplay on how you maximize those workers and does so without a lot of rules. It’s the essence of elegance. 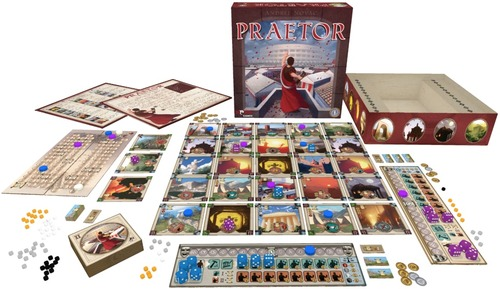 Praetor takes that formula and adds the incredibly awesome experience mechanism. In many ways, this is the game. Placing your workers is a big part, but managing your workforce is really where the game is here and it’s done very, very well. It took me writing this to realize that. And that’s probably what I love about this game so much. I didn't even talk about the "get stuff to build stuff" or the Wall tiles. Those are all part of the game. 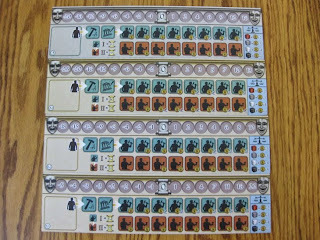 What makes this game truly awesome is the experience mechanism and how it affect your use of workers. It's phenomenal, actually. 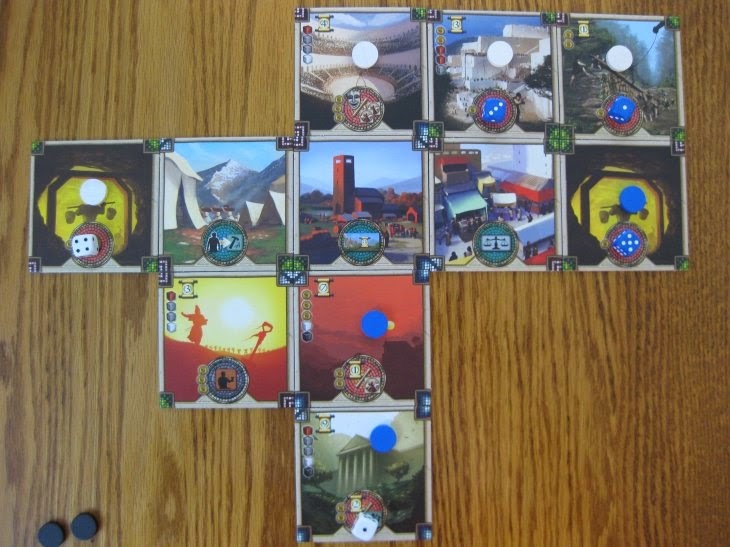 I’ve got a lot of worker-placement games in my collection, but none do what Praetor does. It sits on the line between medium/medium-heavy and does it gracefully. The game feels very fluid and moves wonderfully. 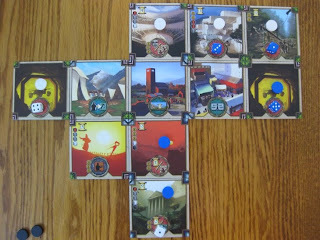 The tile-placement points may be a bit bolted on, but it doesn’t detract from the elegance of this game. Sometimes “elegant” is a dirty word in gaming. That’s not the case with Praetor. This game is incredibly well balanced and deserves a LOT more attention than it’s getting.